We had a "double header" today, two new dogs coming in for their assessments. First came Jesse, then later, Charlie. 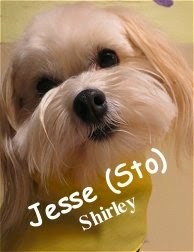 Jesse is a good looking, three year old, twelve pound, blonde colored, Havanese. Heading upstairs to The Fort's Little Roll, Jesse was bright-eyed and curious. He met with a few different pack members, just minutes after his arrival. Jesse did well "meeting and greeting", he enjoyed the company of the others dogs, and mingled quite fluidly. Although Jesse didn't do much one-on-one or "dyadic play", we believe he will get into that over time. He is a darling little canine, that enjoyed his stay here today. 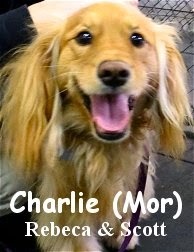 Charlie is a unique, one year old, thirty-five pound, Petite Golden Retriever. Charlie ventured to the Medium Roll play area full of anticipation and interest. Right away, he was introduced to the Medium Pack, and instantly began to communicate with them properly... By standing still, moving his tail a bit, and allowing the other dogs to approach and sniff him first. Within seconds, we knew that Charlie spoke "DOG" well, given his body language and comfort level, while meeting multiple canines at once. After the slightly overwhelming intro was over, Charlie slipped into his "groove", seemingly becoming pleased with his new surroundings and friends. Charlie played a lot with many different dogs, and it was a site to see. First-rate job Jesse and Charlie, you are both accepted to Fort Fido. Woo hoo!